This isn't your normal 2008 Topps 14 card team set, this one's special. See that foil logo in the upper corner? 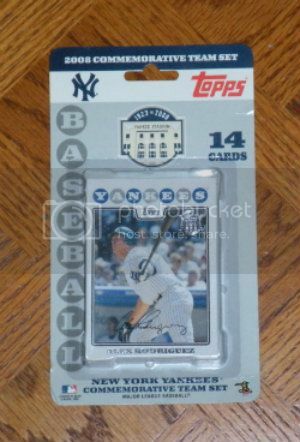 Yep, this is a New York Yankees Yankee Stadium Final Season 14 card team set. Pretty cool. The back of the package says it's limited to 18,000. This may look like just another random insert from the 2012 Topps Series One set but it's a little more special than that. 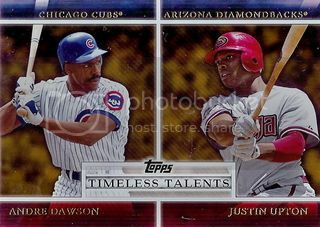 Not only does it feature two of my favorite players in Andre Dawson and Justin Upton but it was sent to me by Andre Dawson super collector, Brian from 30-Year Old Cardboard. You can check out some of the highlights from Brian's collection here. Thanks, Brian. This one's a great addition to our Diamondbacks collection. I first found out about the Red Ice insert set from the 2012 Bowman set at Dan's blog "It's like having my own Card Shop." As Dan pointed out, the red border looks great with the D-Backs red jerseys. They're extra cool because they're numbered to only 25. 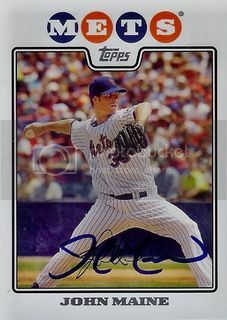 After losing a bidding war for the Daniel Hudson one that popped up on eBay, I grabbed this one a few days later for less than five bucks. 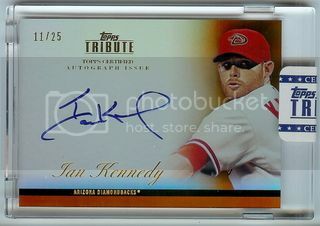 I picked up this Ian Kennedy certified autograph from the 2012 Topps Tribute set from a guy on eBay a few weeks ago. I threw in a modest bid. When it was all said and done, I didn't win. To my surprise a few days later I got a second chance offer. 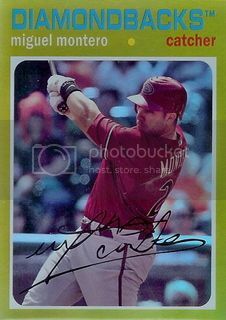 $10 shipped for an autograph from one of my favorite D-Backs that's numbered to 25. Yes, please! 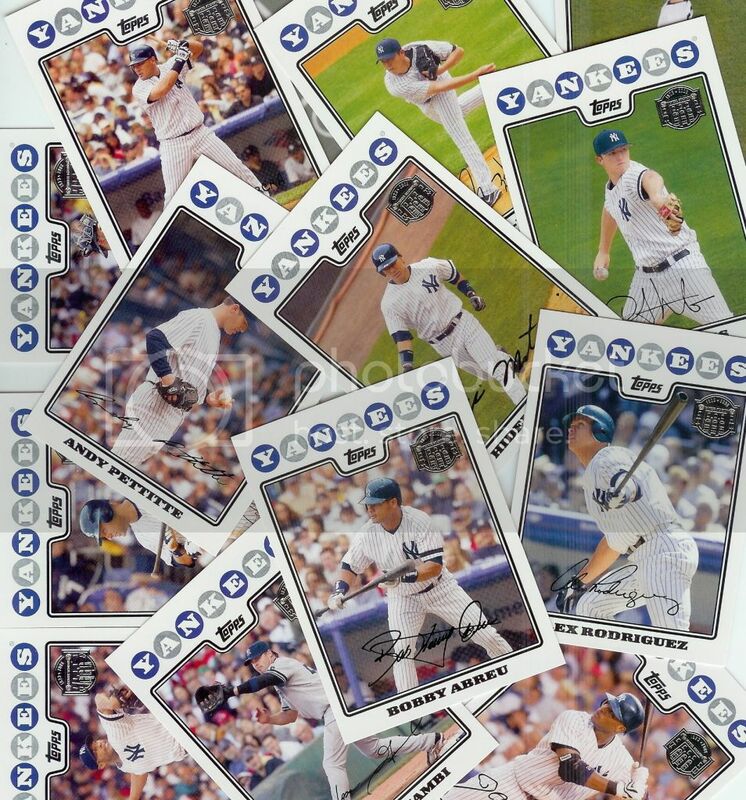 Blog reader Dan has helped us out with some great signed 2008 Topps cards in the past. This time he's really out done himself. He sent over seven new cards. All of them are amazing! Travis Hafner is another player that I really liked a few years back. This dude was crushing the ball in 2006. That was the year he hit six grand slams setting a single season record. Dan hooked me up with a signed 08 Topps card of this Indians legend. Thanks, Dan! With these seven cards, we're dangerously close to the halfway mark for our set! Dan came through with another card that I've been trying to get signed for awhile now. John Maine resurfaced this Spring with the Boston Red Sox. He didn't make it out of extended spring training. I just found out he signed with the Yankees and made his first appearance for their Triple A team last week. Glad to have this one done with. 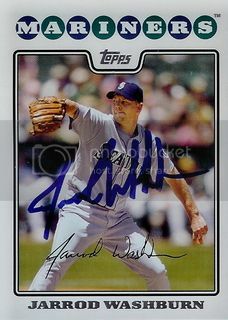 I know I sent at least one TTM request to Jarrod Washburn before he retired in 2009. 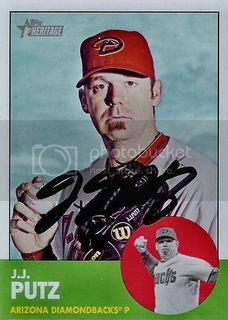 Even though he was always a pretty good signer, I didn't get my 2008 Topps card back. Thanks to Dan, we've got this one locked down now! 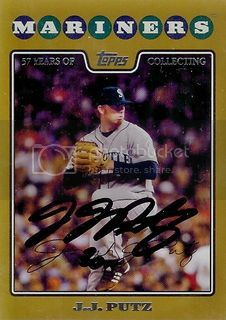 Jarrod put up some good numbers with the Mariners and he was a big part of the 2002 Angels team that won the World Series. Next up is 2004 American League Rookie of the Year winner, Bobby Crosby. This is another one that I have wanted to get signed for awhile. I was a pretty big Bobby Crosby fan during his early years with the A's. Since then he's spent time with the Pirates and Diamondbacks but hasn't played since 2010. 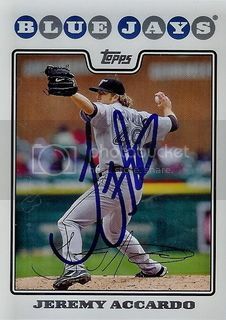 I remember Jeremy Accardo best from the 2007 season when he filled in as the Blue Jays closer when B.J. Ryan was out with an injury. This year he's part of the Cleveland Indians bullpen and is doing quite well since being called up about a month ago. Next up is two-time All-Star and member of the 2004 World Champion Boston Red Sox, Derek Lowe. 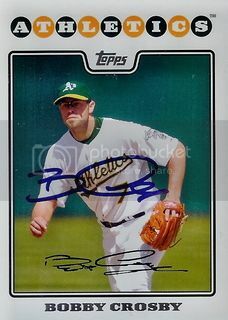 This is one of those cards that I figured I wouldn't be able to get signed for a long time. Plus I've never had anything signed by Lowe before so I was extra excited to add this one to our collection. Thanks, Dan! No saving the best for last this time. We're jumping right in. My favorite card in the group is this Johnny Damon from Series 2. Damon is now on the Cleveland Indians and Dan had some luck getting his autograph before a recent game. This one's awesome. I'm not sure if Johnny will end up in the Hall of Fame but he'll definitely be one of the most remembered players from the past ten years. When Frank from Cardboard Legends sent me that super rad Luis Aparicio card, he also threw in this Miguel Montero card from the 2012 Topps Archives set. I like how these Gold Rainbow Foil cards scan. It turns the beautiful rainbow effect that Topps was trying to create into a puke green color. Totally awesome. There's a little bit of mystery around Woody Williams 2008 Topps card. John over at Donruss 1982 summed it up nicely in his May 2011 post. 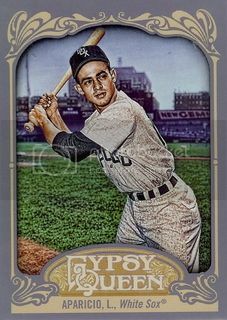 Woody was supposed to be card # 621 in the 2008 Topps Series 2 set. At the last minute he was replaced by Denard Span which led to mass confusion everywhere which has continued on to this day. There's even a listing on Amazon right now for a Woody Williams # 621 card. I guess the seller didn't realize that the card he has pictured is actually of Denard Span. I didn't find the # 621 card but I found the next best thing. Woody Williams was included in the Houston Astros 14 card team set. And Woody Williams was nice enough to sign that card for our collection. I doubt he had any idea how excited this simple gesture would make me. It's Free Shipping Friday! For this week's installment, here's a certified autograph from Angels shortstop, Erick Aybar. How much do you think you'd have to pay for a wonderful card like this? What's not to like? 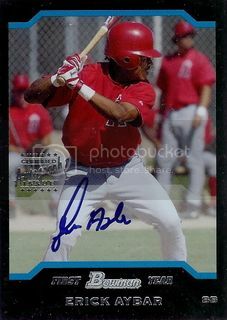 It has an on card signature, it's a rookie card, and Erick Aybar's an established big leaguer. You're probably thinking this had to have set me back at least $5. Nope, not on Free Shipping Friday. We grabbed this one for $1.33 with free shipping. It probably helped that the seller spelled Erick's first name wrong in the auction's title. 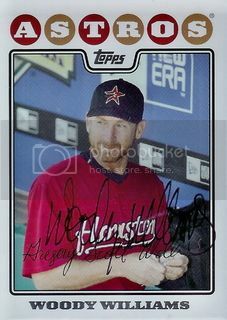 Oh what a glorious set the 2007 Upper Deck Sweet Spot Signatures was. Too bad the signatures are all fading away. 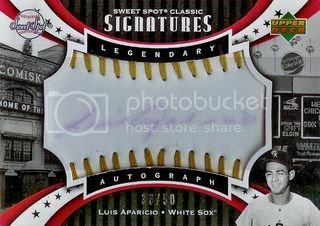 On this Luis Aparicio, you can still make out most of the autograph. It looks better than a lot of others I've seen. Plus, this one's numbered to 50 which makes it even more awesome. Frank from Cardboard Legends sent this to me in a trade. If you're not familiar with Frank's blog, you should be. He's working on getting the 2009 Topps set signed. Thanks, Frank! 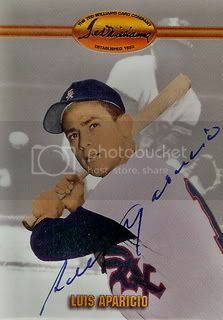 This makes a great addition to our Luis Aparicio collection. I picked up this Joey Votto card and I don't really know anything about it. 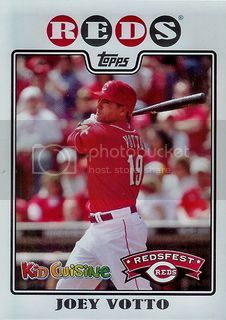 It looks just like other cards in the RedsFest set we bought awhile ago but it has a Kid Cuisine logo on the front. If anyone knows anything about this or has any more like it, please let me know. 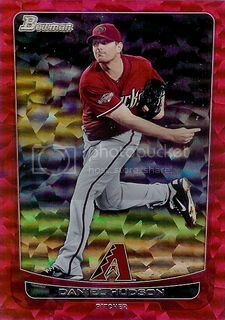 I found out on Friday that Diamondbacks closer, J.J. Putz was going to be at a free signing at a local AT&T store Saturday morning. My son and I headed over there wearing our D-Backs shirts and went home with two signed cards. The second card is a gold border parallel for our 08 Topps collelction! 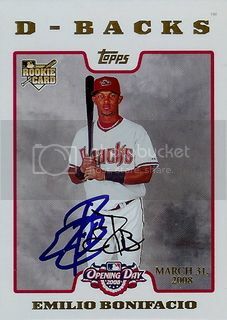 The first is this card from the 2012 Topps Heritage set for our Diamondbacks Collection. Good news! 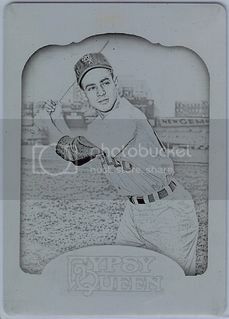 We got our first Luis Aparicio Printing Plate! It's a black plate from the 2012 Topps Gypsy Queen set. Brian over at 30-Year Old Cardboard supplied the base card to go with it. Thanks, Brian. I was pretty excited to add this one to our collection. We got it for a good price and it's a really nice card. Does anyone else listen to ESPN's Fantasy Focus Baseball podcasts? If you do, you're probably familiar with their "Bona fide or Bonifacio?" drop. It's my personal favorite with "The Dirty Fuentes" coming in at a close second. Anyway due to that drop, I've become a fan of Emilio Bonifacio. Plus he put up some good fantasy numbers for me before landing on the DL recently. 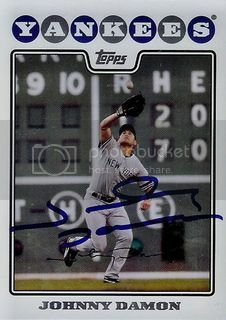 A friend on SportsGraphing.com helped me out by getting the White Border Parallel version of Emilio's 2008 Topps Opening Day card signed for us. Pretty cool. 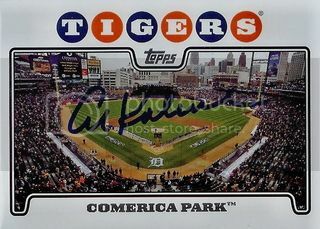 We were able to get Detroit Tigers legend and Hall of Famer, Al Kaline to sign the stadium card from the 2008 Tigers 55 card team gift set. 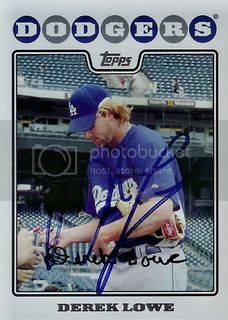 This one shouldn't come as much of a surprise if you're a regular reader of My 2008 Topps Set Blog. You might remember the other stadium cards in our collection that are signed by HOFers Duke Snider, Whitey Ford, and Bobby Doerr. This one will go perfectly with those. Thanks, Mr. Kaline! I look forward to the day when my son is old enough to appreciate these cards so I can explain to him who these legends are. Our Luis Aparicio collection is still going strong. We don't have too many non-certified signed cards of Lil Luis but I got this one for a good price. It's from the 1993 Ted Williams set. This was a low end set but it has a really nice, simple design. I guess that these along with the Pacific Legends sets kind of pioneered the way for the Archives and Fan Favorites sets we'd all come to love in the early 2000s. 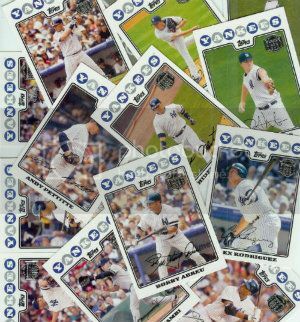 Alright I know this is probably overdue but My 2008 Topps Set Blog is officially announcing our second player collection. It's of our favorite current Arizona Diamondbacks pitcher, Daniel Hudson!